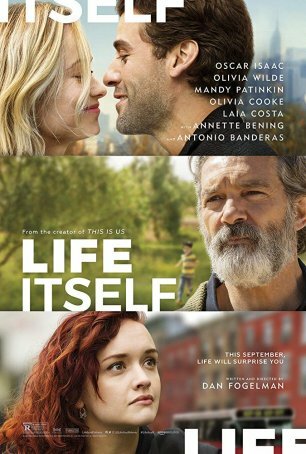 Life Itself starts out with great promise – a dizzying first act that creates the tapestry of a character’s life by offering a kaleidoscope of moments from his past. It’s poignant, effective, and punctuated by actions that are breathtakingly sudden and unexpected. However, after the strong beginning, the movie takes a conventional turn. The result, although not exactly disappointing, doesn’t live up to the expectations established during the first half-hour. The ending, which includes a patronizing sermon provided by the movie’s narrator, feels rushed. There’s also a sense of anticlimax – just as we get to the encounter we have been expecting for most of the movie, the story ends. Because of the way Life Itself is structured, it would be unfair to say more about the story. The movie’s effectiveness relies on the viewer progressing through the lives of characters without explicit knowledge of what happens next or how all the pieces fit together. The concept of the unreliable narrator, however, which is a foundation of the first act, evaporates as things progress. Although it defines the title (“Life itself is the ultimate unreliable narrator”), the screenplay loses interest in the Rashomon approach past the 40-minute mark. The tone adopted by writer/director Dan Fogelman (Danny Collins) is one of darkness with occasional peeks of light and humor. One character, as a young child, witnessed the decapitation of a father. Another endures a series of painful deaths. There’s the story of a boy who watches as his mother is belittled and diminished by his abusive father. There are infidelity, madness, and peanut butter & jelly sandwiches. For the most part, Life Itself succeeds on an emotional level, which is as much a testimony to a series of strong performances as to Fogelman’s screenplay. The filmmaker has assembled an impressive cast: Jackson (in what amounts to a cameo), Bening, Isaac, Wilde, Mandy Patinkin, Jean Smart, Olivia Cooke, and Antonio Banderas (among others). The standouts are Isaac, Cooke, Banderas, and (appearing later in the film in segments set in Spain) Laia Costa and Alex Monner. The actors imbue their characters with a humanity that transcends the storyline’s occasional contrivances. We become involved in their lives and feel deeply whenever the encroaching darkness sneaks up to touch them. Fogelman didn’t set out to craft a downer of a movie and, although the numerous “happy” flashbacks have a double edge (sometimes, in the midst of grief, it can be painful to remember the most intense moments of joy), they lighten some of the burden. The ending is hopeful, although the wordiness of the final scene feels over-the-top. It’s as if Fogelman, perhaps unsure the movie conveys his point, opts to be explicit. The movie works better without any narration (excepting the jokey Samuel L. Jackson material at the outset); it’s unnecessary and distracting. Overall, however, I appreciated the care with which the characters are developed and the respect accorded to their circumstances. There are a lot of nice little touches (the homages to Pulp Fiction and the decision to subtitle the portion of the film set in Spain) and, although the movie’s strength occurs early in the proceedings, it tells a story worth being told.